Despite their hardscrabble existence in the high-altitude desert of India’s remote Ladakh region, the cashmere goat herders of the Changthang Plateau produce some of the world’s softest and most highly prized wool. 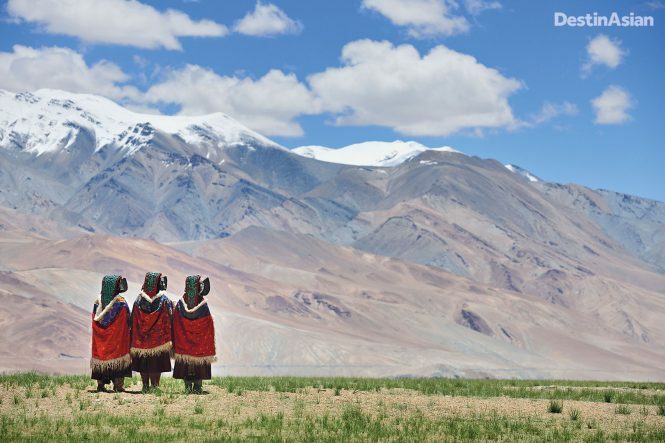 Changpa nomads in traditional dress near the shores of Tso Moriri, one of the highest lakes in the Indian Himalayas. Veronique Vermussche had her first brush with cashmere during a trekking trip in the Himalayas. Stuck for hours in Lhasa’s airport between flights, the self-taught Belgian designer came across a wool shawl in a gift shop. Knitted by a Tibetan artisan, its fabric was so delicate and warming that it gave her goose bumps. It also gave her an idea: to create a line of chic, contemporary cashmere apparel made from the finest goat’s wool. Launched in 2016 with a collection of shawls, capes, and cardigans, that brand—Tuinch—is now one of Europe’s most exclusive luxury knitwear labels, showcased in designer shops from London to New York and Hong Kong. 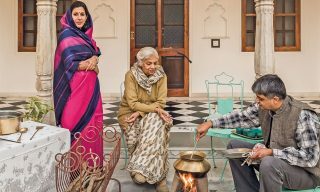 Working with traditional artisans in India’s Kashmir Valley, Veronique says Tuinch is one of the few fashion labels to source its wool directly from Himalayan herders. That commitment has brought her back to the region often in the pursuit of the softest and purest cashmere and pashmina wool. 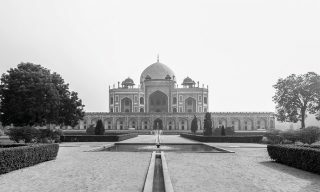 I had read of her arrival on the fashion scene with great interest, so when Veronique invited my photographer husband David and I to join her on a summertime trip to northern India, we quickly packed our bags. 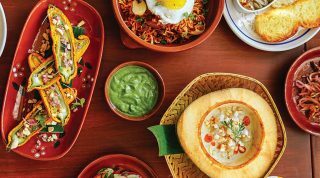 The itinerary included visits to her Kashmiri knitting factories and a four-by-four expedition out to the Ladakhi part of the Changthang Plateau, where we’d be visiting the seasonal camp of nomadic Changpa goat-herders. Who could say no to that? 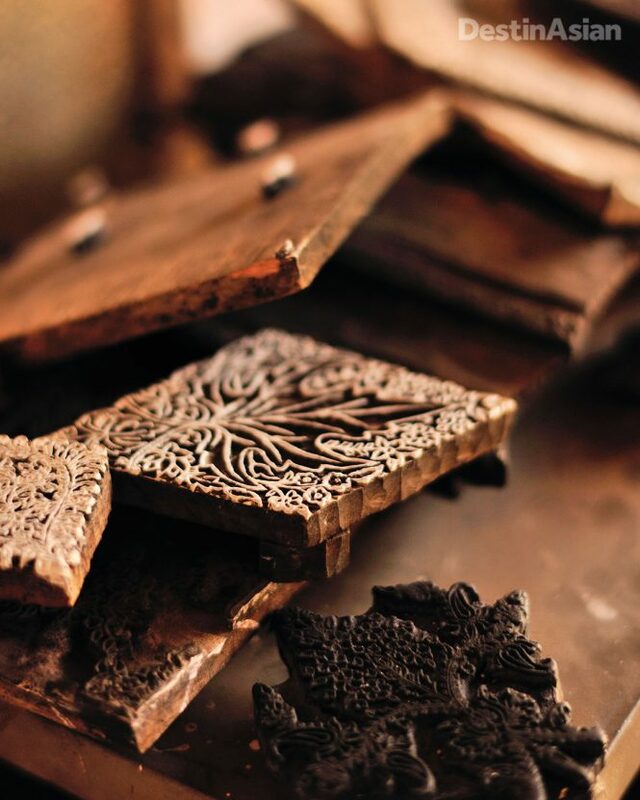 Wooden printing blocks at a textile workshop in Srinagar. Our first stop is Srinagar, the summer capital of the Indian state of Jammu and Kashmir. 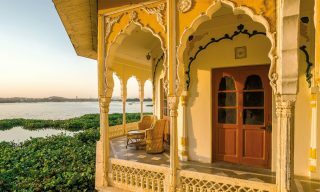 Situated on the banks of the River Jhelum in the Kashmir Valley, the mountain-ringed city is at its prettiest on the shores of Dal Lake, a shimmering expanse dotted with bright lotus flowers and cedarwood houseboats framed by intricate fretwork. In the terraced Mughal gardens built centuries ago around the water’s edge, schoolchildren scamper among the fountains and ponds as resplendently dressed Kashmiri women admire the season’s roses. For all its reputation as a restive region, the Kashmir Valley feels like the most tranquil place in India. This is especially so amid the gardened grounds of our hotel, the Lalit Grand Palace. 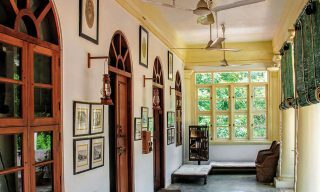 Originally built as the residence of a maharaja in 1910, it is still adorned with handsome furnishings, carpets, and handicrafts by local artisans. That night, we drink gin and tonics in the hotel’s old-worldly Dal Bar. Through the windows, we can see the distant lights of houseboats glinting like stars above the darkened lake. Early the next morning, we drive to the Old Town area of Srinagar just as it awakens: tiny shops slowly open their doors and the narrow streets come alive with prospective buyers. Ancient-looking wooden houses that I wrongly assume to be abandoned soon morph into busy workshops and ateliers where Kashmiri men embroider gorgeous woolen and cotton fabrics, or block-print lustrous pashminas. We then stop by the banks of the Jhelum, where small groups of men are washing raw cashmere in the olive-brown waters. 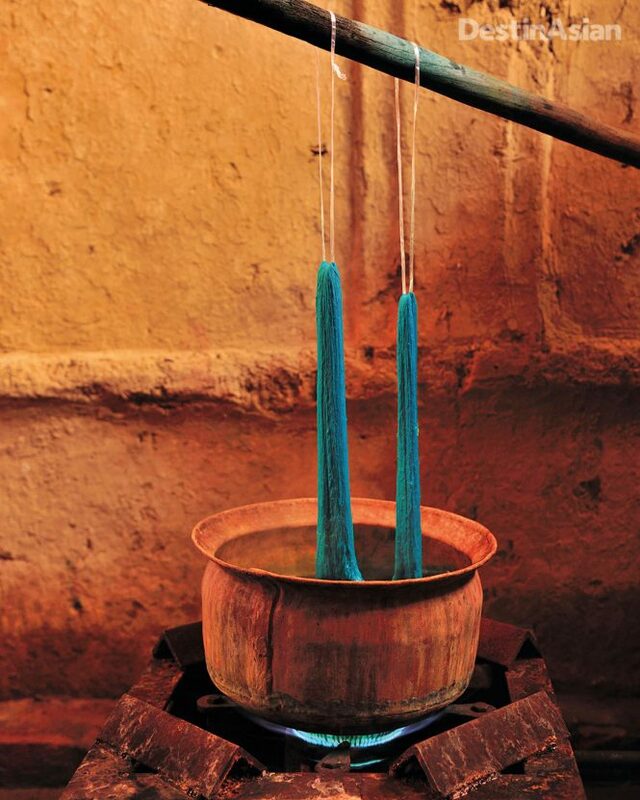 They strike the wool against the rocks with full force and then tumble them in creaking old drying apparatuses. The near-violent action on the riverbank is a stark contrast to the serene silence we later find in one of the rural workshops Veronique works with. 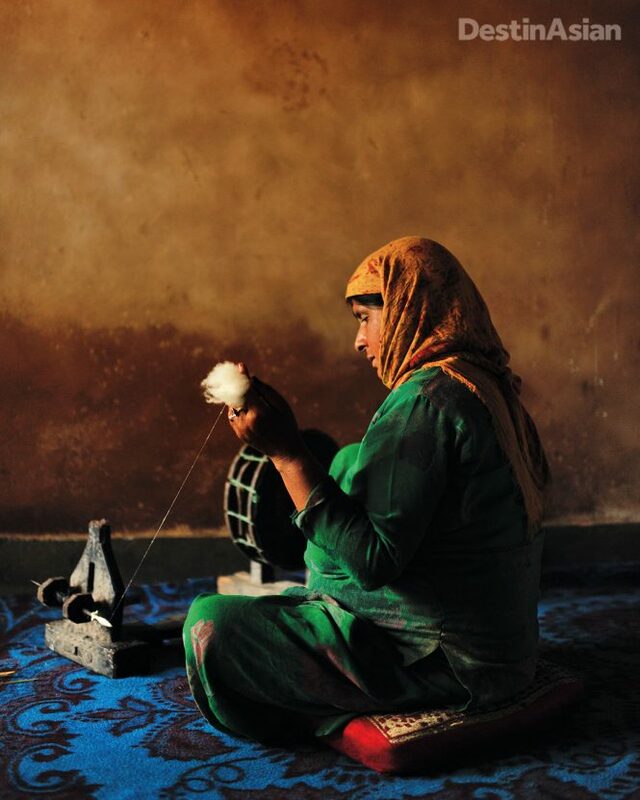 Here, Kashmiri women spin wool without saying a word, their fingers gliding over the fine strands as the spinning wheel hums a hypnotic tune. We also visit a factory where young men dye the cashmere in bubbling pots before it’s hung outside to dry in the scorching afternoon sun. Veronique Vermussche at a Changpa camp helping out with the combing process. We’re back in Srinagar’s Old Town the next day to meet some male weavers who create beautiful cloths from pashmina yarn on traditional floor looms. David and I observe them in complete silence. The artisans’ deep concentration and solemnity makes the weaving seem almost a sacred activity. There are no radios playing in the background or cell phones beeping; just the sound of the loom’s gently clanking harnesses and the whisper of the shuttle through the weft. Inspired, Veronique sits down with the weavers and starts to knit with her own needles and pashmina. Every now and then the men look up from their work, peering from behind their small eyeglasses to watch her. An artisan spins cashmere wool. From Srinagar, we make our way 400 kilometers east to Leh, the onetime capital of the former Himalayan kingdom of Ladakh. Located 3,500 meters above sea level in a high-altitude desert, the town feels a world away from India’s teeming crowds. In June, the vast, cloudless sky above the Himalayas is a deep blue color, the perfect backdrop for the pale white monasteries dotting the arid landscape. Soon after arriving at the airport, we are whisked away in a four-by-four along the Indian Army–built Leh–Manali Highway as it follows the meandering Indus River. Tonight, we are bedding down at the luxurious Chamba Camp near Thiksey Gompa, a monastery that’s one of the most important religious sites around Leh. To make the most of our scenic surroundings, we are sleeping in tents. These are no ordinary tents, mind you, but custom-made canvas suites with hardwood floors, four-poster beds, and Raj-era trunks. 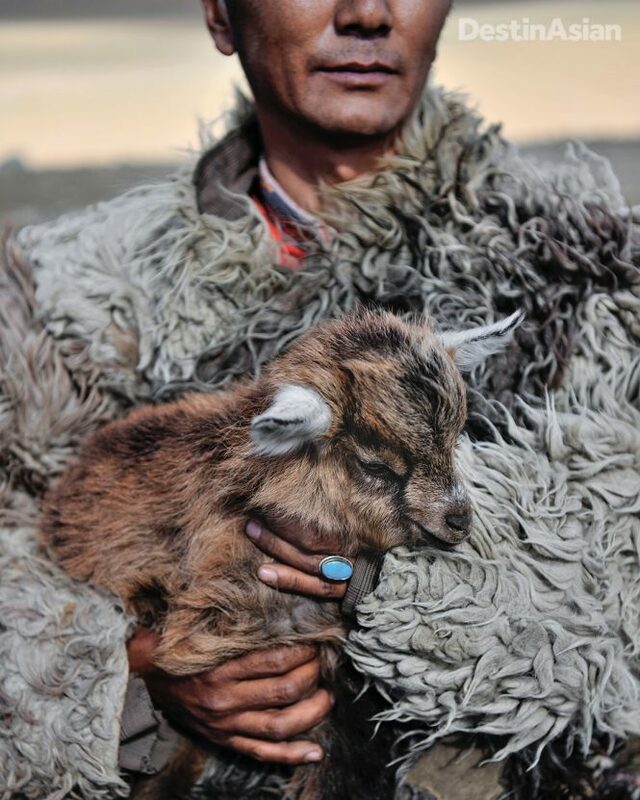 A baby cashmere goat in the arms of a Changpa nomad. Chamba Camp is really the only luxury option in Leh and the surrounding area. It’s also the perfect base for exploring the town, hiking, biking, or rafting on the Indus River, or spending a day with the monks of Thiksey Gompa. Once checked in, we regularly spot the building, perched on a small hill, from the camp’s voluptuous gardens. From our breakfast table on the deck of the restaurant tent, I can even hear the sound of the shankha, a horn made out of a conch shell, during the call for prayer or before a puja, a sacred ceremony. After visiting the monastery, it’s time to trade our luxury tent for a simpler version. We’re moving to the remote Changthang Plateau, which extends from the wilds of eastern Ladakh deep into Tibet. Categorized as a cold desert, it is one of India’s five listed biodiversity hot spots, with short summers and blisteringly cold Arctic-like winters. But in spite of its harsh climes and sparse vegetation, a unique biotope has emerged, supporting animals like endangered black-necked cranes, elusive snow leopards, and Himalayan blue sheep. It is also the traditional home of the Ladakhi-Tibetan Changpa nomads, whose way of life—and the supply of the world’s finest quality pashmina wool—depends on their ability to continue grazing their herds of goats on its thin, top-soiled grasslands, which sometimes stand more than 5,000 meters in altitude. 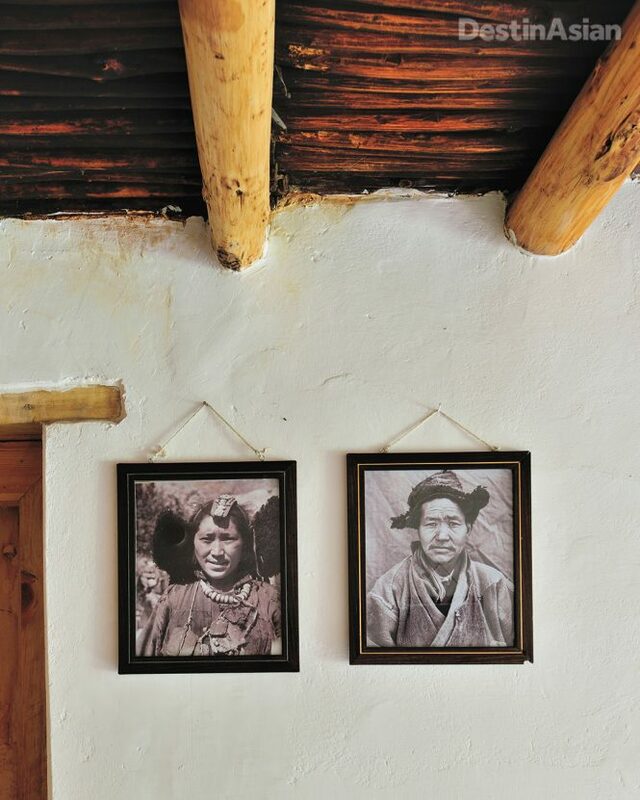 Portraits at Nimmu House, a heritage hotel outside Leh. We’re able to get in close contact with this community because we’re traveling with Veronique. 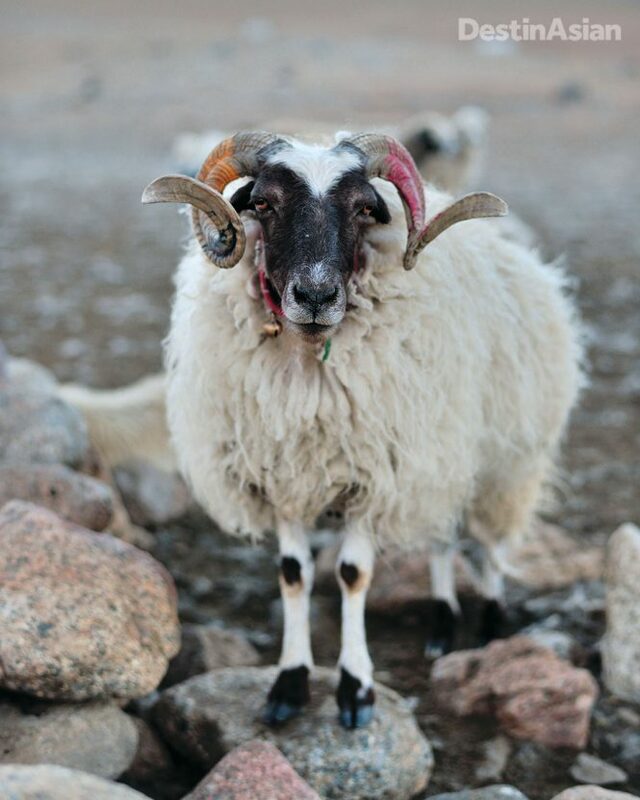 She’s picky about where her designs are sold but even more so when it comes to sourcing cashmere. For the rest of the journey, we have to pack oxygen bottles, warm clothes, and a good sleeping bag. 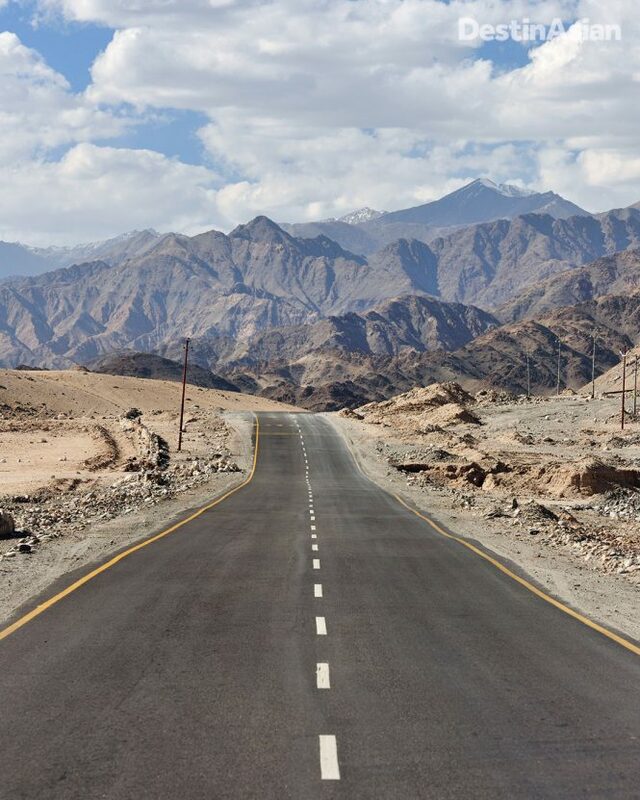 Our drive will take a full day from Leh via mountain passes and twisting gravel roads. We will be going entirely off the grid, just the way we like it. Before the crack of dawn, the four-by-fours are packed and ready to go. Our final destination is Tso Moriri, a lake spread over an area of 120 square kilometers at a dizzying elevation of 4,525 meters above sea level. Perched on the lake’s northwestern shore, the hamlet of Karzok is nothing more than a collection of shabby mud-brick houses, most in need of serious repair. There are a couple of small shops and two guesthouses. It’s basic, but for true adventurers the views over the often crystal-clear and tranquil Tso Moriri are magical. Cashmere goats are well adapted to the harsh Himalayan conditions. We’ve come at just the right time: there’s a small festival and the Changpa nomads have all descended on Karzok to perform a ceremony with much singing and dancing. Everybody is dressed according to their tribe and which corner of the Changthang region they come from. Their wrinkled, sun-beaten faces—and their attire—are a portrait of the harsh lives they live. Some men are dressed in heavy jackets with layer upon layer of sheepskin; some women wear thick felt coats. Their silver jewelry and headwear is brightly adorned with mountain coral, Himalayan lapis, and even animal teeth. I’m struck by the fact that these simple Buddhist families supply the world with its most delicate and expensive wool. During the winter, when temperatures plunge far below zero, the Changpa nomads take shelter with their goats in small hamlets. But warmer months are spent on the endless pastures of the Changthang Plateau, living in yurt-like tents that offer protection from the icy wind and chilly, starry nights. Their goats roam the valleys and fertile riverbanks before returning home at dusk. The whole family helps out with the affair—even the kids take care of the baby goats who stay behind while the adult goats leave to graze. Far from the busyness of our lives in Europe, Veronique, David, and I fall into a gentle rhythm dictated by nature, sharing yak-milk tea with the nomads in their warm tents when the wind picks up and freezes our hands and cameras. We bring them cookies bought from the only shop in the village and they pour us more buttery tea. At night, we lie freezing in our beds, once in basic tents in a small tourist complex, days later in an unassuming guesthouse, wondering how cold it must get in the yurts of our new friends. On the road between Leh and the high-altitude lake of Tso Moriri. After each goat is combed, it is marked with a dab of paint and released again to join the herd. Tea is drunk and more cookies are handed out. We spend the whole day with three generations of this nomadic family who live together in the same camp but in different yurts. When all the wool has been collected, they sell it for a fixed price per kilo to a cooperative owned by the government. Through a translator, I ask one of the nomadic ladies if she would like to live a more modern and comfortable life. Her answer, together with a shy smile, is a decisive “no.” This is their life, together with their beloved cashmere goats up here in the Himalayas, far away from the mad world beyond this wild mountain range. 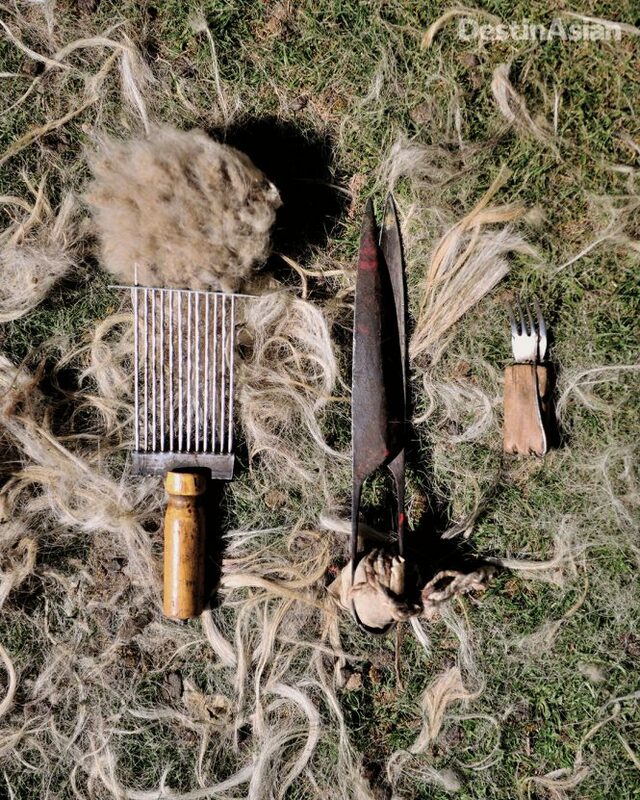 Tools used for plucking wool. Jet Airways is one of five Indian carriers that service both Srinagar and Leh from Delhi, which has nonstop flights from most major Asian cities. If you’re pressed for time, Air India flies direct between Srinagar and Leh. 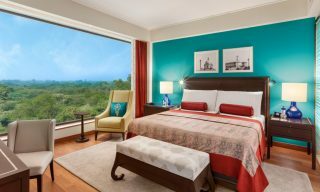 Set back from the southern shore of Dal Lake, The Lalit Grand Palace Srinagar (91-194/250-1001; doubles from US$233) has 113 well-appointed rooms and suites. Outside Leh, Chamba Camp Thiksey – Ladakh (91/801-090-2222; all-inclusive multi-day packages from US$1,573 per person) offers three- to seven-night stays in deluxe tents. Rates include all meals, a private tour manager, chauffeur and vehicle, plus ground experiences in the itinerary. The camp is typically open from May 15 to October 10 each year. 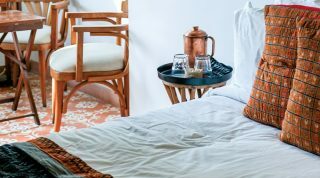 Tailor-made experiences in Kashmir and Ladakh can be booked through Ampersand Travel, a luxury tour operator that has been organizing trips to India since 2003. This article originally appeared in the August/September 2018 print issue of DestinAsian magazine (“Fleece Offerings”).